November 5th from 4 to 7 PM. The Clubhouse at Saddlebrook Golf Course. Today, the City of Indianapolis announces trick-or-treat hours for Halloween and offers up tips to help trick-or-treaters stay safe. Trick-or-treat hours in Indianapolis will be from 6 – 8 p.m. on Tuesday, October 31. IMPD will have extra patrols and enforcement in neighborhoods during these times to protect the safety of residents during Halloween festivities. •	All IFD Fire Stations from 6-8 p.m.
•	IMPD Southeast District Headquarters located at 1150 Shelby St from 3-7 p.m.
A map of all participating locations is attached. Hurry, don’t miss your opportunity to reserve your seat for the Personal Safety & Awareness Seminar on Monday, October 23rd @ 6:30p.m. The Seminar will be held at Municipal Gardens (1831 Lafayette Rd.) Please call Kim Taylor @ 317-327-6572 to reserve your seat. Please join us on Wednesday, November 1st @ 6:00p.m. for our NW District Task Force Meeting. 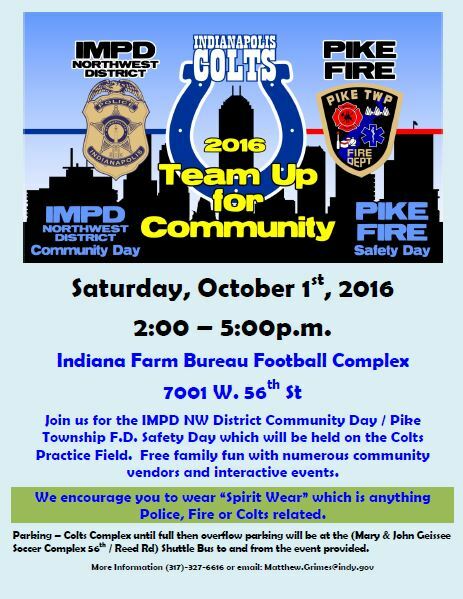 We will be meeting at IMPD NW District Headquarters 3821 Industrial Blvd. The Marion County Sheriff’s Communications Center will be our featured speaker. Learn about what happens when you dial 911. Please invite a neighbor to attend with you. Each household is permitted 40 bags of leaves for weekly disposal. Place leaves in large plastic trash bags and place near your regular trash cart. Place the leaf bags out by 7 a.m. on your regular trash day. Keep all leaf bags at least three feet away from cart collection areas to ensure trucks can service the carts. On Oct 10, Mayor Joe Hogsett and the Indianapolis Metropolitan Police Department (IMPD) introduced new city services on my.indy.gov. These changes come as part of the continued “Shift Indy” initiative, a long-term project to drive government service forward and allow for greater transparency and access. The commonly-used services are the first to roll out from both IMPD and the Mayor’s Office. The addition of these new services comes in advance of a full transition from indy.gov to my.indy.gov in 2018. On the Mayor’s Office page, residents will find a streamlined experience for requests pertaining to appearances and official documents. New features within IMPD include an updated “Send a Traffic Complaint” form, which addresses speeding and other traffic concerns, and an “Ask for Extra Patrols” form to request increased police presence within neighborhoods. In addition to the launch of these services, the Information Services Agency is working daily to evaluate, update, and create new services. Indianapolis and Marion County residents should expect new service roll-outs and website enhancements on a quarterly basis. To avoid confusion during this time of transition, both the current indy.gov and the new my.indy.gov will live simultaneously as new services are rolled out and current content is redirected. Central Indiana Transit Plan Lunch n’ Learns! Indy Connect is hosting lunchtime information sessions about the Marion County Transit Plan and upcoming ballot question. Bring your lunch to any of the September sessions to learn how the plan will affect your neighborhood. •	implement the Blue and Purple rapid transit lines along high-ridership corridors, and expand the Red Line. The full plan would be completed and operating by 2021. •	12:15 -1 p.m., Nora Branch Library, 8625 Guilford Ave.
•	12:15 -1 p.m., Glendale Branch Library, 6101 N. Keystone Ave.
•	12:15 -1 p.m., Eagle Branch Library, 3325 Lowry Rd. •	1:15 – 2 p.m., Pike Branch Library, 6525 Zionsville Rd. Looking for a way to highlight your neighborhood and make a difference, but need some assistance? 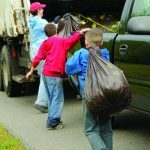 The application for the 2017 Great Indy Cleanup Focus Neighborhood is now available at www.greatindycleanup.com. The Great Indy Cleanup Focus Neighborhood is a way for KIB to highlight the beautification efforts of two Indianapolis communities, one in the month of April and one in the month of October. KIB will assist in organizing large scale clean ups with engaged neighborhoods, while working alongside residents, volunteers and community stakeholders. Projects are selected by the community for the good of the neighborhood. With litter being the main focus, other projects can also include murals, invasive removal, tree planting, flower/garden bed prep and more. This is an opportunity to spur change in your community with the help of KIB and the City of Indianapolis. Application deadline for the 2017 Great Indy Cleanup Focus Neighborhood is August 19, 2016. Please direct any questions to Lauren Wright, Great Indy Cleanup Community Coordinator at 317-264-7555 x116 or LWright@kibi.org.